Welcome! The Portugal Golden Residence Permit Program is a six year investment-based residence process for non EU nationals. 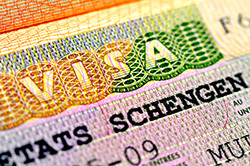 The residence permit allows free circulation in the Schengen Zone of 26 European countries and only requires an average of seven days per year stay in Portugal. After five years as a resident, the applicant is eligible for citizenship if desired. The immigration by investment program of Portugal allows affluent persons of impeccable standing and repute, including their families, to receive Portuguese residency and eventually citizenship. Once citizenship is granted, the applicant may live, work or study in any of the member countries of the European Union. Portuguese citizenship (EU citizenship) offers full European Union benefits, including Schengen borderless travel and a United States visa waiver. This means visa-free travel to more than 160 countries in the world, including the USA, Canada, Middle East, Africa, Asia, and most countries in North, Central and South America. Permanent residency obtained through the Golden Residence Visa requires a minimum real estate investment of EUR 350,000. Portuguese citizenship, i.e. the European passport, is available to Golden Residence visa holders after five years in permanent resident status. The government of Portugal is offering Portuguese residency and citizenship (European citizenship) to foreign investors who contribute to the country's economic development. Portugal is the westernmost country of mainland Europe and a stable, neutral and respected member of the European Union since 2002. Portugal has produced streamlined legislation to create an efficient process by which non-EU residents may obtain a residence permit - and citizenship if so desired - based on investment. A relatively small country of approximately 11 million people, Portugal is considered very safe and boasts a low crime rate. Portuguese is the main official language, but English is also widely spoken, particularly by younger people and especially in the tourist regions. The Portuguese Golden Residence Permit Program is a six year investment-based residence process. After five years as a resident, the applicant is eligible for citizenship if desired. Main applicants are required to make one of three qualifying investments: A. The acquisition of real estate with a minimum value of EUR 350,000; or B. The transfer of capital with a minimum value of EUR 1 million; or C. The creation of at least 10 new jobs registered with the social security department. Applicants are free to choose one of these three investment routes. Our associated attorneys are are licensed to practice immigration law in Portugal and can answer all of your immigration related questions. Our immigration associates in Portugal are working exclusively on Citizenship & Residence matters and will stand by your side throughout the entire application process, from start to finish. The team will work with you until your residence or citizenship by investment application has been approved and you have received your residence certificate or Portugal (EU) passport.